Dungeonknight.com has literally gone "Rambo" with the issue of their authentic replica Rambo knives. They have decided to celebrate the success of the previous four Rambo blockbuster hits with the release of some great new Rambo knives. Dungeonknight.com has gone totally Rambo following the announcement that Rambo V will start production in the spring of 2010. They took a decision to celebrate this declaration with the release of some new amazing Rambo knives. The different variations of Rambo knives were created specifically to celebrate this new announcement and the past Rambo movies. 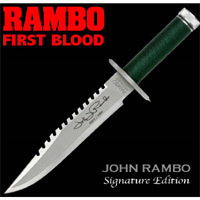 From Rambo I to Rambo IV, each Rambo installment is well represented by an authentic movie replica Rambo knife. Each knife has been perfectly replicated in virtually indestructible 420 J2 stainless steel. Some collectibles simply gather dust as you look at them once and then the excitement dies down. Not with these bad boys, these Rambo knives can also actually be used as regular knives and can take a large amount of abuse and damage. The upcoming 2010 Rambo movie is rumored to have a star studded cast and many are looking forward to seeing what could be the last of the Rambo installments. Sylvester Stallone will be playing his usual self John Rambo while it is also predicted that Mickey Rourke will play an important role in the movie. Just based on these two actors, it's easy to understand why Rambo fans can't wait for the release of Rambo V.
"It seems like every guy at one point, has enjoyed a Rambo movie," said Mathieu Courchesne, CEO of Dungeonknight. "Dungeonknight.com's Rambo knives are the ideal way to demonstrate your admiration for Stallone's heroic acts. We're confident that every Rambo fan will want to put their hands on one of these Rambo movie replicas!" For the ultimate fans of the Rambo series, the Dungeonknight.com Rambo knives are a great way to remember them all by. Until October 31st, 2009, Dungeonknight.com is giving a 10% coupon off all Rambo knives. Simply enter the "rambo" coupon without the quotes during the checkout process.